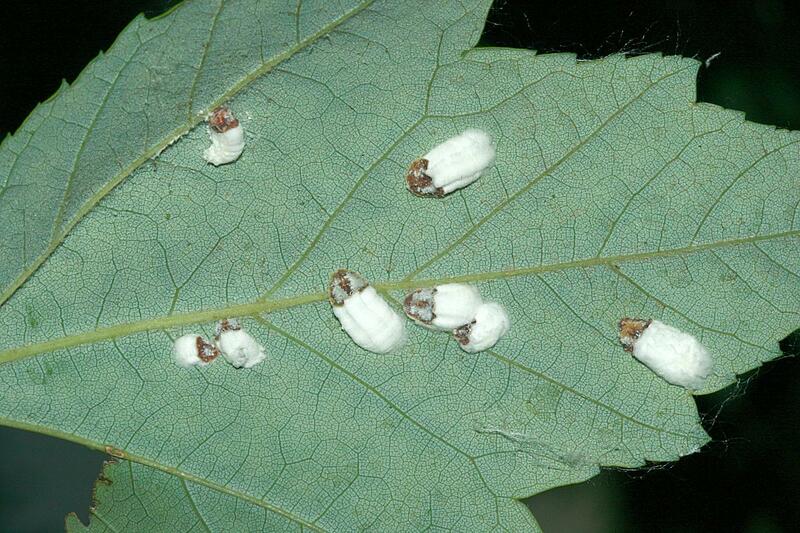 The cottony maple scale, Pulvinaria innumerabilis (Rathvon), is a highly modified insect pest that commonly attacks silver and red maples in Ohio. These soft scales are usually first noticed during the summer months when the female produces a conspicuous white egg sac, called an ovisac, that appears as a ¼- to ½-inch long ball of cotton. Heavy infestations can result in branch dieback and in rare instances, tree death. Cottony maple scales are occasionally confused with a close relative, the cottony maple leaf scale, Pulvinaria acericola. Cottony maple leaf scale females form their ovisacs on leaves, not on branches. Heavily infested branches can be killed by the cottony maple scale. Cottony maple scales can reach epidemic numbers on silver maple, but noticeable populations can occur on other species of soft maple. It is also known to be able to survive on other deciduous trees and shrubs including honey and black locust, white ash, euonymus, oak, boxelder, dogwood, hackberry, sycamore, linden, beech, elm, willow, basswood, poplar, rose and sumac. Normally, this peculiar scale is a mere curiosity and a nuisance. High populations can result in branches being completely inundated with females and their white egg masses. Occasionally, with very high infestations of feeding crawlers, leaves may turn yellow and fall prematurely, ultimately causing individual branch dieback. Rarely, heavy infestations have been found to kill stressed or weakened trees. The crawlers, or immature scale insects, produce large amounts of honeydew while feeding on leaves. Honeydew is the excess water and sugar excreted by many plant-sap-feeding insects. It is commonly mistaken for "plant sap" being dropped on cars, sidewalks and lawn furniture lying under trees. As honeydew collects on leaves and branches, bees, wasps and ants are attracted to the area to feed. Additionally, an unsightly fungus called "sooty mold" begins to develop on the honeydew, turning the leaf surface a gray-black color which, in turn, may hinder photosynthesis. Mature cottony maple scales are small, flat, oval, brown insects without obvious legs, antennae or wings. They are firmly attached to the twigs and branches of various trees and may be ¼ to ⅜ inch in diameter. At maturity, the females produce the white, cottony egg masses, called ovisacs, over a period of several weeks. The "cotton" is actually a waxy secretion enveloping the ovisac, which may contain over 1,500 eggs. These eggs hatch from mid-June to August, and the young nymphs called scale crawlers emerge. These tiny crawlers are small, flat, oval insects with two distinct eyes, short antennae and tiny legs. The crawlers walk onto the leaves and tend to attach alongside the major leaf veins, usually on the underside. Here, the nymphs produce copious amounts of honeydew and grow by molting once. By this time, the scales look like two different kinds: a translucent white to pink form and a larger, flat, tan form. These are male and female scales, respectively. In September, the male scales emerge as tiny winged gnatlike insects that move around on the leaves in search of females. After mating, the males die and the females soon withdraw their mouthparts and crawl back onto small twigs and branches. Here, they reinsert their mouthparts and settle down for the remainder of their life. When the sap begins to flow in the spring, the females continue to feed and grow, producing considerable amounts of honeydew. By late May to early June, the females have matured, and they begin to produce their ovisacs. Female scale after producing egg sac. Cottony maple leaf scale females and egg sacs. Second instar cottony maple scale nymphs. Notice that ones with black color are parasitized by a tiny wasp. This pest has numerous parasites and predators that normally keep its populations in check. However, every few years, these natural controls seem to fail and the cottony maple scale can reach epidemic proportions. What makes management of this scale more difficult is the fact that insecticide applications may actually cause the scale problem to continue longer than normal. This is a result of a poorly timed pesticide application that kills most of the parasites and predators but allows survival of the resistant scale stages, protected by their waxy covering. Regular mosquito fogging is also blamed for killing of the predators and parasitoids. Small, newly transplanted trees or weakened or stressed trees due to drought, compacted soils, poor fertilization, etc., are the ones most likely to exhibit major branch or crown dieback, or even death. Improved growing conditions and pruning out the dead branches will greatly promote plant health. There are several predators and parasitoids that will naturally keep cottony maple scale populations in check. Unfortunately, these natural enemies are also extremely susceptible to pesticide applications, so timing chemical treatments properly is very important. The most important predators are several black lady beetles. The most common one, Hyperaspis signata, has a larva that looks like a mealybug. Both the adults and larvae enter ovisacs to feed on the egg masses. These lady beetles continue to feed on the nymphs that settle on the leaves. The settled nymphs are also attacked by several tiny parasitic wasps. These wasps lay eggs inside the nymphs, in which their developing larvae feed on the pest from the inside out. Affected scales often turn brown or black and have tiny round emergence holes on their back surface. Soaps and horticultural oils can be very effective in managing the freshly settled crawlers. These materials also have minimal adverse effects on the adult lady beetles and parasites already in settled crawlers. Insecticidal soaps or 1.5 percent horticultural oil must be applied thoroughly to the leaves, both to the underside and upper surfaces, in order to kill the scales. Soaps and oils only kill the pests on contact. Application of soaps or oils should be made in mid-July and again in early August, if additional crawlers are found. Several insecticides are registered for control of scale crawlers and newly settled crawlers. These pesticides, again, often need to be applied in sufficient spray quantity to wet both the leaf upper and lower surfaces to be effective. Apply registered products in mid-July and again in the second week of August for best control. Trunk and soil injections can be done in the fall or spring. Always follow the pesticide label. Dormant oil sprays have been traditionally used to manage many scales on ornamental trees. Unfortunately, many maples are sensitive to these oil sprays and significant small branch dieback or spring leaf drop can occur if the dormant oil is applied after the maple sap has begun to flow. This fact sheet is a revision of HYG-2019.